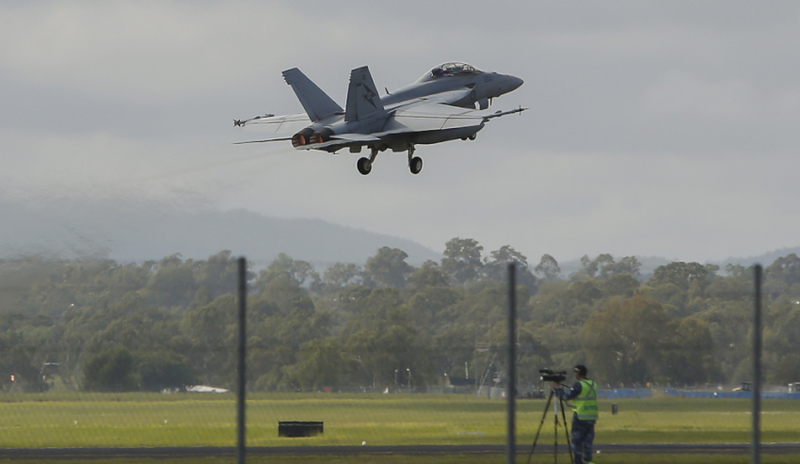 A Royal Australian Air Force No 1 Squadron F/A-18F Super Hornet takes off from the runway. Image via Commonwealth of Australia, Department of Defence. Australian advanced composites manufacturer Quickstep Holdings has delivered its third quarter results for 2017-18, revealing not only strong sales growth but development activities with a leading aerospace giant are now underway. In its Q3 FY18 update, Quickstep said development activities for two new small contracts from Boeing Defense for F-15 and F-18 components have commenced. Contracts with Boeing were signed in the first half of FY18. Quickstep, which is one of Australia's largest contributors to the global Lockheed Martin F-35 Joint Strike Fighter program, said the contracts have increased its partnerships with leading defence companies or 'tier 1 customers' and business opportunities. "These contracts add a new tier 1 customer, and business platforms and part families to our portfolio," the quarterly update report said. "Most importantly, they provide a pathway to Boeing supplier accreditation which will open significant future business opportunities across the Boeing company." The Australian company finished Q3 FY18 with a total sales revenue of $14.6 million, an increase of 15 per cent compared to $12.7 million in Q3 FY17. Year-to-date sales were $42.5 million, an increase of 14 per cent compared to $37.3 million to Q3 FY17. All components were supplied on time and in line with program demand. The business remains on track to deliver higher JSF volumes over the next two years. During the quarter, Quickstep also signed a European Sales and Manufacturing Agreement with ATR Group, a leading Italian company that designs, prototypes and manufactures structural parts and components in advanced composite materials for the European market with a focus on developing specific automotive and commercial aerospace growth opportunities for Qure and QPS in the European market. The partnership aligns with Quickstep’s ambitious approach to growth that includes the realisation of capacity in its Bankstown, NSW facility and other extensions into relevant markets, leveraging its proprietary out-of-autoclave process technology Qure and the Quickstep Production System (QPS). According to Quickstep CEO and managing director Mark Burgess, the arrangement with ATR Group will provide the business with a strong manufacturing partnership in the European market with a highly-respected composite company. “ATR has key strengths in design, development, tooling and advanced manufacturing across both the automotive and aerospace sectors. We have big ambitions and high expectations for this agreement,” he said.